Children are funny. My son has been attending summer school since July 9th and every day he has to go to school I have to shake him awake to get him up and ready for school (he needs to be out the door by 7:20 a.m.). He doesn't have school on Fridays and can sleep in if his little heart so desires. Wouldn't you know it, he is up with the chickens on Fridays. He was up at 6:00 a.m. this morning wide eyed and bushy tailed! My day to sleep in too, you know! My youngest was really crabby this morning too. During school days she sleeps til 9:00. Today she was up at 6:00 a.m. too and CRABBY! A mother can't win sometimes. My husband took this photo at Twin Harbors, MN. It was a port we discovered by accident while looking for some other attractions driving along the north shore. We spent a couple hours near this port watching and waiting for the ships to leave dock so my husband could see it head back out to open water. There was this peer that went way out into the lake with a fog horn on the tip. That day it was incredibly foggy and there was this giant sign warning people to stand clear since the decibles of the fog horn could knock a person over. 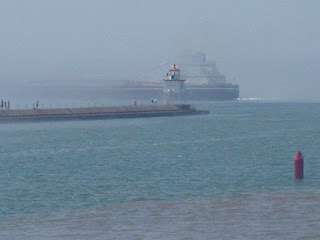 We didn't get to hear the fog horn on the peer but the ships horn was blarring as it head out to open water. There were two ships at port when we were there. One was able to leave port without any trouble, but the second one had to turn back into port and try the process again. It was a longer ship and was closer to the shoreline. It looked as though it was having trouble with the shallow water and rocks near shore. This little tugboat is what brought us near the habor in Twin Ports. 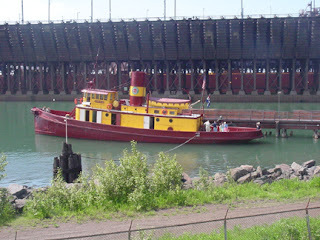 I spotted a sign that said tugboat tours while driving through Twin Ports. Turns out, it was just a tour where you got to look around the little tugboat while it was ported. We thought we might be able to board the tugboat and get a "tour" of the shoreline. Although we didn't board this tugboat, we were glad we came to the peer since we got to see a ship leave shore and got to see it up close. 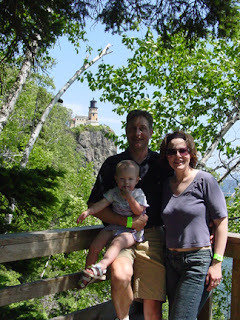 After we left Twin Harbors we headed up the north shore to Split Rock lighthouse. Up in the lighthouse is some of the most beautiful views of the lake and shoreline! Ok, I know it's hot. It has to be hot when even the kids think it's hot. They thought the kittens were hot too apparently. They thought they were being nice to the poor little kitty when they put her in the freezer. If I hadn't gone out to the freezer to look for something to make for supper we would have had catcicles! I just wanted to ask my four year old if she did it and she must have thought I was really upset, I chased her all around the yard -- man she's fast! I sat the kids down in the house when everything settled down and explained to them that no matter how nice they thought they were being to the kittens, they would have killed the poor things. Oh, the things little children do. I haven't posted in a while since I am so darn busy with all of the preperations for my parents 50th. I have completed the program flyer, you can see what it looks like here. Now I am working on the cake design. I was able to create a beautiful sugar rose from sugar paste this afternoon. I am practicing up so the cake is the best it can be. My intentions are to make white roses and dust them with edible gold dust. I took a picture of it and will post when I get my disc filled up. I just have finishing touches to make to the video presentation and that should be good to go. Now I just need to figure out how to project it from my computer onto a projector screen or the wall. 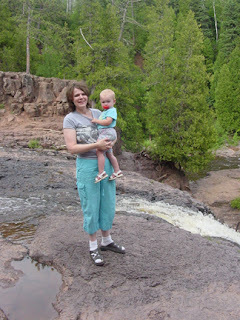 Last month my hubby and I managed to sneak away up north to Duluth, MN for a weekend (with baby in tow) leaving the other five kiddos behind. 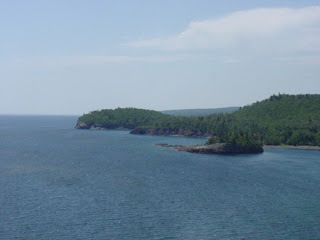 We had a wonderful time sight-seeing at Split Rock Lighthouse, Gooseberry Falls, and Twin Harbors. I had the pleasure of getting a Suddenly Slender seaweed wrap and was able to shed 6 lbs! No, I haven't gained it back and it is a whole month later. My hubby treated me to it for our anniversary. Duluth is the only location in the entire state of MN that has an authorized wrap facility. That got me thinking...maybe I should open one down here in central MN. Well, I sent for the info from Suddenly Slender and after reviewing the info and doing a little research, I determined it wasn't the right direction for me. I would love for someone else to open up a facility closer to me, however, you would have a guaranteed return customer!